There's very few photos of Nate out there, so excuse this grainy shot! Former Boston Celtic Nate Driggers is in court on charges of receiving stolen arms in Chicago this week, and if you can't seem to remember him, you're forgiven. 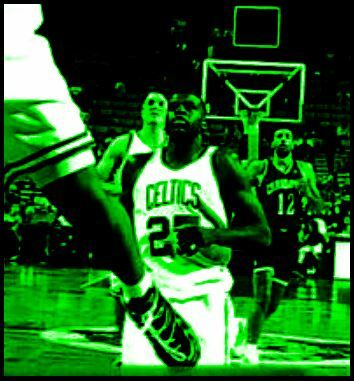 Driggers, who appeared in a whopping fifteen games for the 1996-97 Celts - the worst Celtics squad ever to take the floor and tied for 17th worst in league history with as many wins as Driggers appeared in - was not exactly a prominent part of the team's history, logging 2.4 points and 1.4 boards per game in a season many of us have blocked from our collective memories. But a Celt he was, for just under a year in the depths of the wilderness era, and it doesn't look like his luck has gotten much better over the last two decades, if the allegations against him are based in fact. ESPN and the Associated Press report Driggers is charged with having been delivered a cache of stolen firearms stolen off a freight train in a Chicago rail yard in the South Side on the 12th of this month. The guns, valued at $50,000 and numbered 100, were reportedly stolen by local gang members and delivered to Driggers to fence, which he allegedly provides as a service, according to prosecutors. The defense notes the witnesses are all alleged gang members seeking to reduce their sentence by blaming Driggers for their crimes. Whatever the truth of the matter, it's certainly not a situation anyone wants to find themselves - or former employees - in. I personally have no opinion on whether Driggers should beat the charges levied against him in the Chicago court system, but I imagine I am not alone in hoping the Celtics beat the Chicago Bulls tonight at home. For more stories about the Chicago Bulls on CelticsLife, click here. For more by Justin, click here. For more about Nate Driggers, check out tbt727's longform article here.